So, how does it work? Well, the idea is the same as in the sound card tester: two measuring points behind the shutter and one lightsource (or two leds, for more precision). 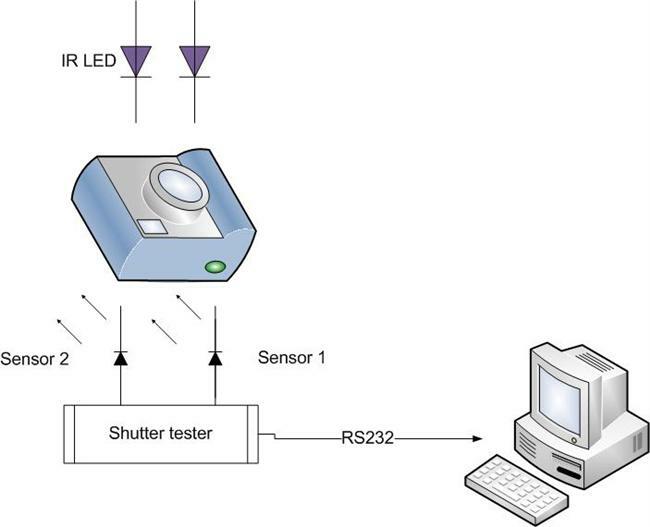 Now, the twist: the tester does the stopwatch and then relays the information to a computer via a serial port (RS232). Why is that? Because I simply hate (with big H) doing math and programming microcontrollers. It's awful. Ok, then why not just use the pc alone in that case? Well, the answer is simple and stunning: it's not precise enough. 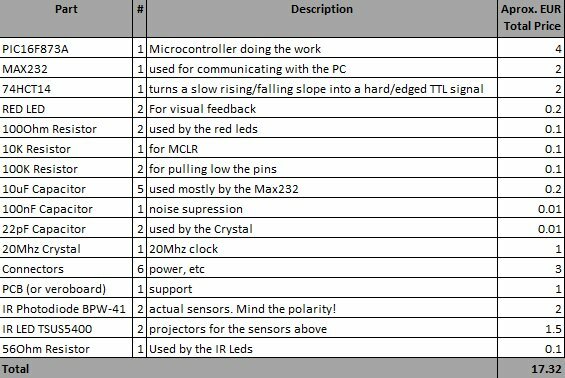 Use your RS232 port and try to measure intervals using a higher language like .net for example. It's a total failure, you won't get precise readings. But before getting into technical details, lets recap the horizontal shutter mechanism. 1. Shutter cocked. 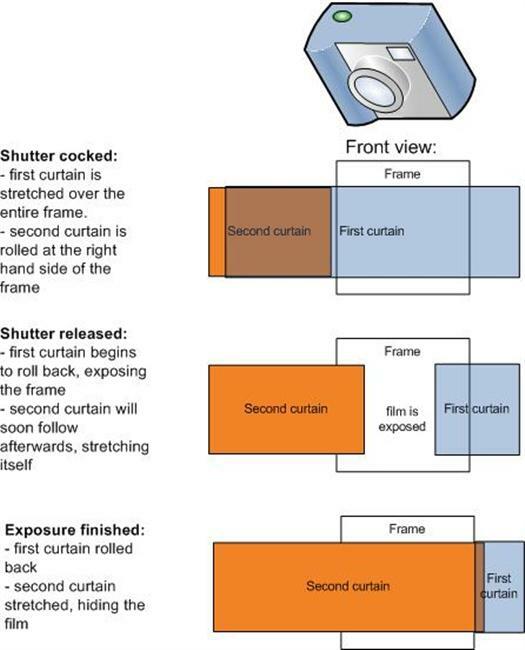 Film is shielded by the first curtain. 3. Exposure has finished. The second curtain does what it does best: keeps the film from getting exposed. 1. No sensor gets light. Both ON (yes, ON). 2. First curtain moves: the first sensor (black) is exposed to light. It goes OFF. 3. Second curtain moves, making both sensors OFF. This is the case of a speed slower than sync. In order to use flash, the entire frame has to be open. Otherwise, if a flash is fired when a curtain is still in the frame, a shadow can be seen in the frame (try firing your flash at 1/4000 to get an idea..). 3 bis. If the speed is above cameras' sync speed, then the second curtain will not wait for the first curtain to have finished its travel. It's actually so anxious that it will start right away after the first one, leaving just a small gap between them. That gap is actually the film light exposure. Notice how the two sensors are ON, despite the film beeing exposed! 4. First curtain has finished. The second is on it's way. This is why the second sensor (on the left) is still OFF as it receives light. The one on the right is ON as it does not receive light. 5. Exposure has finished. Both sensors ACTIVE (ON). 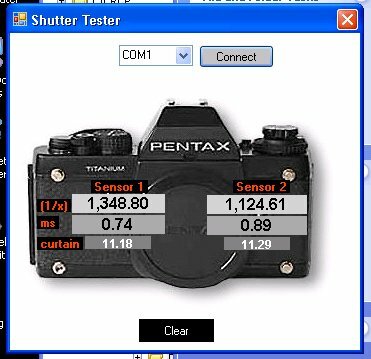 - in order to get the speed of the curtain in ms (milliseconds, usually used in repair manuals), we need to calculate the speed over the entire frame. I've used 30mm distance between the sensors. So the result of the measurement would have to be multiplied by 36 (as in 24x36mm film format) / 30. - try placing the sensors as precise as possible. It changes the result quite a bit if you're not careful with this. - do not place the sensors too close to the frame edge (less than 2mm) as the curtain generally begins to slow down at that point, so it's not relevant. Same for the frame start, the curtains are still accelerating at that point. Ok, so let's get to the hardware. Here's a brief diagram here. It's small, but you have all the EAGLE (freeware version available) files at the end for convenient downloading. I've made the hardware as modular as you would like. That means I can change the measuring probes just by plugging them into the right connector. That way I can have a sensor for horizontal 24x36, another one for 24x36 but with vertical shutter, another one for 6x4.5, etc, each with its own distance between the sensors. The software takes that into account. The measurement allowed by this hardware are generally between 1 second (above that it's not relevant IMHO to have a less than 10% precision) and all the way up to a terrible speed (>1/4000 for sure, absolutely enough for just about any other mechanical camera out there. The electronic ones are quite impossible to repair). I wish you good luck. If you happen to find bugs, improvements, etc, I would gladly accept any informations on that. Software is provided as is. Permission for commercial use is NOT granted.